SAP is stepping up customer guidance on S/4HANA deployments, but it’s full speed ahead on app modernization, predictive analytics and data services. Here’s a look inside SAPPHIRE 2016. SAP CEO Bill McDermott admitted at this week’s SAPPHIRE NOW conference that some prominent customer CIOs had recently offered some unfavorable reviews, telling him that SAP wasn’t listening hard enough to their needs. It’s not that SAP’s “lack of empathy” had gotten in the way of success. In fact, McDermott said that over the last year SAP had signed up more than 3,200 customers to move to the company’s next-generation S/4HANA applications suite, making it the company’s fastest-growing product ever. Behind the scenes, 160 are live, 800 are implementing and the balance have purchased but are “in the pipeline,” as my colleague Holger Mueller reports. But a few shortcuts were taken in the rush to market, McDermott admitted. That’s why he pledged to provide detailed product roadmaps, industry-specific migration paths and a business-exec-oriented “value assurance guarantee.” It’s not that the technology wasn’t ready, he said. What those CIOs wanted was more guidance on who would do what and when in a migration of the old Business Suite to S/4HANA. What’s more, C-level peers wanted more assurance that the investments would yield business benefits. SAP-Microsoft Alliance: In an extension of a longstanding partnership (remember Duet? ), SAP and Microsoft announced new and deeper ties. The deal starts with S/4HANA and HANA certification to run on the Microsoft Azure public cloud. In return, SAP is expanding on existing integrations to Office365, such as links between Outlook and Concur for reporting of expenses and between Outlook and SuccessFactors to facilitate HR requests and alerts. MyPOV: SAP already had an implementation and cloud alliance with IBM, but I see even greater potential in the Microsoft deal. The Azure public cloud is surpassed only by Amazon Web Services in popularity. What’s more, many customers in Microsoft’s vast small- and midsized-company customer base (as well as many of its large customers) are predisposed to the cloud. Now they have a familiar platform on which to run S/4HANA. SAP API Business Hub: SAP announced a beta version of this API hub as part of the latest HANA Cloud Platform release. The Hub is designed to make it easier for customer and partner developers to access, collaborate on and develop new application programming interfaces. MyPOV: The SAP ecosystem wants APIs largely to gain access to data in SAP systems and external systems in order to create new apps and services, executive board member Bernd Leukert told me during a Q&A session. The Hub will support APIs not only for conventional SAP apps, but also for cutting-edge capabilities such as artificial intelligence, cognitive computing, data-visualization and geospatial analysis. Easy API access is a must have, but it’s good to see there’s a bigger vision for the API Business Hub. Rebranding Under BusinessObjects: SAP announced a consolidation and simplification of its analytics portfolio under the BusinessObjects brand name. The two big categories are SAP BusinessObjects Cloud (formerly SAP Cloud for Analytics) and SAP BusinessObjects Enterprise for everything BI/analytics that runs on premises. The recently acquired Roambi mobile analytics app portfolio is now SAP BusinessObjects Roambi, and it’s included with BusinessObjects Cloud and offered with BusinessObjects Enterprise as a low-cost option. MyPOV: It wouldn’t be SAP without a few changes in brand names. Let’s hope these new names stick. SAP seemed to be drifting away from the BusinessObjects brand, but in my book you either have to use it or lose it. SAP still has tens of thousands of BOBJ customers, and many of them use no other SAP products. If you don’t put next-generation products like BusinessObjects Cloud (previously SAP Cloud for Analytics) in the portfolio, you cut off the future of the brand. BusinessObjects Cloud Gets Predictive: Beyond the name change, a key update is the addition of predictive analytics capabilities. This first wave includes time-series forecasting and “guided machine discovery.” SAP says it will continue to add algorithms to the portfolio. MyPOV: BusinessObjects Cloud now has more than 1,000 customers in various stages of trial use or active subscription. The predictive capabilities will add to this product’s appeal, bringing forward-looking insight to plans and analyses. The competition includes cloud-based IBM Watson Analytics, which has more algorithms under the hood at this point, but its predictive capabilities are rather black box. Anaplan recently announced a predictive push, but its cloud platform is focused entirely on planning. BusinessObjects Cloud is a single product spanning planning, business intelligence (data discovery and visual analysis) and now predictive. I’m eager to see how SAP balances ease of use with selection and control over best-fit algorithms. SAP Digital Consumer Insight Service: In the digital world, analysts can explore data on referring URLs (where site visitors came from), dwell time (how long they stayed on a site, page or item), and the entire digital path to purchase. The SAP Digital Consumer Insight Service announced at SAPPHIRE offers the equivalent of these measures for the physical world. Customers can download up to three days of mobile traffic data on any location in the U.S. The insights are derived from aggregated, non-personally identifiable mobile phone data from Sybase 365, which interconnects traffic between the major mobile networks. The Consumer Insight Service lets you specify a store location, a restaurant near a potential store location, a zip code or any other geo-defined area. Potential insights include where people came from, where they went to, dwell time, age, gender and device used. The cost is $439 per report (in the form of a CSV data download), with a volume discount of five downloads for the price of four. MyPOV: It’s nice to see SAP practicing what it preaches on coming up with innovative new business models — in this case monetizing its own data. I was surprised that the sales approach is limited to credit card purchasing exclusively through SAPStore.com. I could easily imagine a variety of pricing schemes geared to large businesses, but Jonathan Becher, chief digital officer and head of SAP Digital, tells me SAPStore.com is aimed at the consumerization of IT. The goal is low-cost, no-human-touch online purchasing of SAP software and services with an eye toward a truly broad market. It’s a digital disruption from within SAP, and it’s worth a closer look. S4/HANA. 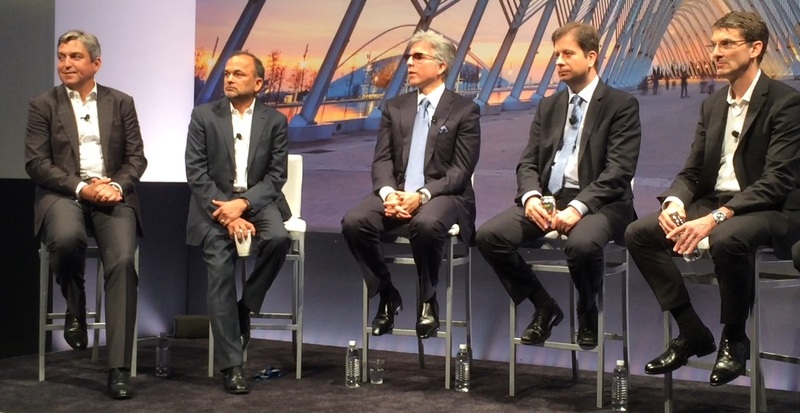 “The technology got ahead of the people,” said McDermott of S/4HANA. That may be, but from what I hear, future progress with S/4HANA is not just a matter of creating reassuring roadmaps, migration paths and value-assurance guarantees. One insider tells me “most S/4HANA customers are net new [greenfield] deployments because the functional coverage isn’t wide enough (yet) for brownfield.” A third-party integrator that helps SAP customers with S/4HANA implementations tells me that changes from S/4HANA release to release and process deprecations have led to reimplementation requirements. The bottom line is that much technical work remains to be done with S/4HANA. Legacy applications are still being simplified or rewritten from scratch. “We’re storming ahead,” Hasso Plattner was proud to say during his keynote, and he pointed to several all-new, never-before-possible applications such as the RealSpend real-time cost analysis app introduced at SAPPHIRE. The keynote case example of Nestle’s S/4HANA deployment clearly shows that larger and larger enterprises are taking the plunge with S/4HANA, but customers will need time to work through sensible migration paths to new applications and processes. Advice to SAP customers: Don’t make decisions based on any generic roadmaps, migration-path documents or brochures. As Constellation Research tells customers in its advisory work, you must first understand your current-state processes and exactly how the technology is used. SAP and systems integrators have diagnostic tools that can show you exactly how your people interact with applications and processes. You need in-depth understanding before you can commit to migrating to new apps and processes. BusinessObjects Cloud. BusinessObjects Cloud has huge promise, but I have to wonder how incented the legacy product channels and sales teams are to promote this option? Success with BusinessObjects Cloud could well mean disruption for BusinessObjects Enterprise. Constellation Research believes that the future will be as much or more about the data outside your four walls as it is about the same old transactional records. Incumbent customer business intelligence leaders and old-school software salespeople may not see that future. It’s up to the innovators within your company to spark experiments with managing, merging, analyzing and perhaps even monetizing data in the cloud. Data and Disruption. The SAP Digital Consumer Insight Service is exciting, but I’m surprised SAP has been quiet, thus far, on plans to help SAP customers to become data disruptors in their own right. Constellation Research advises companies on data-monetization strategies, so we know that many companies are interested in third-party data enrichment and using new combinations of data to drive new business models. It’s an area that SAP competitors IBM, Oracle and Qlik are pursuing aggresively. The good news is that SAP’s learnings on monetizing its own data and on bringing partners into the API Business Hub will be easily transferrable to customers. We’ll be on the leading edge of sharing SAP’s strategy on this front and we’ll advise you on how that strategy fits with your own data strategy.